On my previous post on Lakme Illuminate and Shine Range, I have shown you that I received a few products to play with. When I saw the photo of Kareena Kapoor, I loved the way she looked gorgeous, yet, there wasn't too much of anything. Since I am going fresh faced these days, I immediately jumped in. I am loving this one. What about you? to products reviewed are attached. Lakme Illuminate and Shine: Warm Palette and Burnished Gold liner for the eyes. Tropical Flush Lip shimmer on the lips. 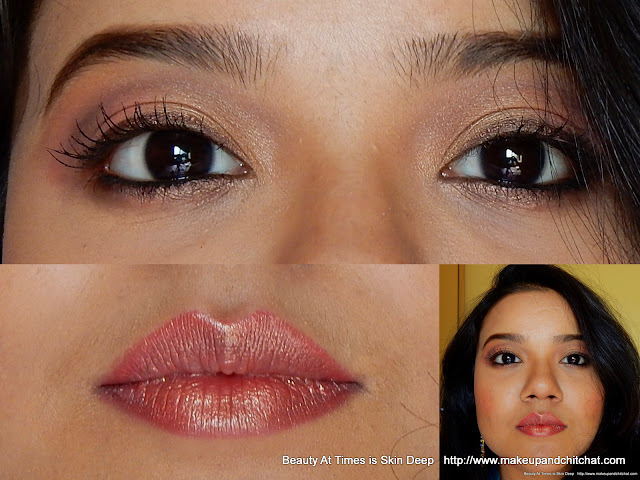 What I did is, I did my base with Lakme 9to5 Weightless Mousse Foundation. brightening. Then, I hid a little bit of this and that with Derma Color D65. Next, I set everything with The Body Shop loose Powder. applied peach from centre to the outer half. And then, taking the deep brown ( it's intense. I took a tiny bit) blended it in the crease to pull the colors together. I also applied a bit of the peach color on the lower lid. Next, taking Burnished Bronze Eye Liner Pencil, drew a line on the upper lash line and underneath lower lash line. Added Lotus Herbals Ecostay Kajal on the waterline and applied loads of mascara from Oriflame. because orange colors can make me look flat. At last, I finished the look with Absolute Shine Lip Shimmer in Tropical Rush. I hope you enjoyed this post. Stay tuned for the reviews of the products. In the meantime let me know what you think of this range. I dunno much about the range yet but the bronzy-sunkissed-kinda-look you created looks apt for the Indian skin tones..not to mention u look fab in this! I was a little skeptical on the lipstick. But the shade looks nice. Love your makeup. You look GREAT. I loved the look you created.